In Nogales, treatments like implants, crowns and other procedures cost hundreds of dollars less than they do in the states. And if you find the right clinic, patients say the quality is unbeatable too. "It's no good having cheap if the quality isn't there," said patient Dianne McFaul. "But the quality actually is much better than what we found over there." The McFaul's came to Nogales for x-rays and a crown, and they'll get it all in just one visit. "Having a crown done, usually you have to wait a week or two and then come back," McFaul said. "It's all done in one day here, and it's so funny to see your little tooth being made on the 3D printer." First: do your research. "Make sure the doctor is a certified doctor," said Jesus Murillo of Dental Departures. Dental Departures is a website that allows you to search by procedure and region for the dental care you're looking for. It lists the dentists' certification and each clinic's contact information. "Every clinic that is published on our website, we visit them, we take the pictures, we meet the doctors," said Murillo. Another resource that patients considering medical tourism should reference is Patients Beyond Borders . It is not just limited to dental procedures and answers many questions you may have before heading out of the country. They have published a step by step guide to planning a successful trip out of the country for medical and dental care . What are the dentists' credentials? Did they attend medical school or just a training program? Ask if the dentist is U.S. board certified because many are. Does the clinic have easy to access contact information? If they aren't prompt to respond to you, move on. How cheap is the price? Finding the best price may not always be the best option. Saving 30% but getting better quality work than the clinic with 70% savings is worth it. What happens if I have a complication? It is important you make plans with the clinic in case of a complication. There are not guarantees in place like there are in the U.S., but speak with your clinic before the procedure to ensure you can get follow up care if needed. Second: check reviews. Both Patients Beyond Borders and Dental Departures list reviews or comments from patients, but other websites like Google and Yelp can be helpful. Third: appearance and cleanliness of the clinic is key. Experts definitely recommend you ask about the technology a clinic has. For example, the Dental Bliss clinic in Nogales has what functions as a 3D printer that can make you a new ceramic tooth in just 30 minutes. Josef Woodman of Patients Beyond Borders cautions patients to use their instincts. If something appears off, you can refuse treatment right up until the very last minute. It is important to keep your health in mind over finding a cheap price. If you're worried about getting down to Nogales, Coyote Dental leaves from Tucson twice a week and goes straight to clinics in Nogales. "We're a shuttle service and a referral service for patients to save 70% on their dental work in Nogales," said retired dentist Mark McMahon. "So, we bring people down and show them the ropes, teach them how to get across and save them all kinds of cash." 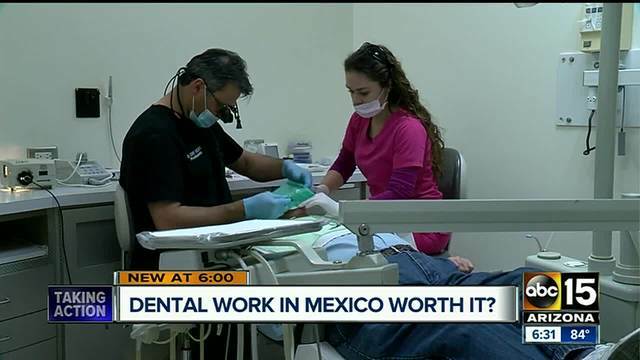 Local dentists here say there are always risks, but it's all about the research. "Dental care is not regulated like it is in Arizona. There's no dental board to file a complaint with," said Dr. Kevin Earle of the Arizona Dental Association. He did say that there are clinics that offer good care in Nogales and in Mexico, but he cautions the patient to really do their research. Sometimes high quality materials are substituted for lesser materials, and that's hard for patients to verify. "It is an alternative, but maybe not the best alternative," Earle said. For some, though, it is the only alternative to high premiums or poor insurance. But, the name of the game: with the right background research, there can be a way to get quality care for an affordable price. Dentistry can be a significant procedure, so it is important for it to be precise.